Fighting-Types have for the last few years been adjusted to account for the impact of cards like Strong Energy and most recently Diancie <Prism>. How far does that go for them? Let’s take a look at Regirock to make an example. Regirock is a Basic Fighting Pokemon, 120 HP, with a Grass Weakness, no Resistance, and a Retreat Cost of 3. Enhanced Stomp is a 1-for-20 that does 20 more damage if he’s got a Tool attached. And Hammer Arm is a 3-for-100 that discards the top card of your opponent’s deck. Whoop-dee-doo! So assuming you’ve got something like Choice Band attached, Enhanced Stomp looks promising, as it does 40 damage on its own thanks to the attack effect, plus 30 more damage if it hits a Pokemon-EX/GX for a grand total of 70 damage for only 1 Energy. And that’s not even including the damage boost from Diancie <Prism> which pushes it to 90 damage, and in Expanded it can further be boosted by Strong Energy to 110 damage and even further than that with more copies of that Energy, possibly even Machamp (FUF) if you so choose. Never mind all the boosting can push Hammer Arm to 150 in Standard and even further beyond in Expanded. What’s the issue then? Probably that Regirock himself could be so much better if the numbers weren’t already so low. 1-for-20 and 1-for-40 aren’t that great, and the ideal Tool Choice Band only works against specific match-ups, which means that you’re only dealing 40 damage to anything without that GX title in the name. That’s not that good! And while Hammer Arm is decently costed, how often do you want to be putting stuff into your opponent’s discard pile where they can use it with other cards that interact with the discard pile? Some of the best strategies have taken advantage of the discard pile, so why would that be good against those? It’s not to say Regirock is bad in Standard, but I find that he’s underwhelming, and the reason I think he’s underwhelming is because of the presence of cards like Strong Energy in Expanded. He could do really well in that format, except that Hammer Arm feeds into a lot of deck strategies, and Enhanced Stomp still needs a Tool to do better, which by that point why aren’t you just using some other Pokemon that can do the same stuff without a Tool that Regirock’s Enhanced Stomp can do with the Tool? Keep that in mind if Fighting ends up being pretty bad outside of niche picks like Buzzwole-GX. Arora Notealus: Regirock just represents one in a long line of what I think is a design handicap for Fighting Pokemon going forward. Strong Energy being able to give every attack 20 more damage as long as it’s attached to a Fighting Pokemon just means that every Fighting Pokemon has to be slightly weaker than what they’d normally be to account for that. Kind of like how Lucario-EX used to have only a couple of moves that were really good, just cause Strong Energy’s presence meant that they couldn’t be any stronger. Regirock ought to have Enhanced Stomp start out at 1-for-40 and go up to 1-for-60 with the Tool, for example, but because of the presence of damage boosters like Strong Energy and Diancie <Prism>, it has to be balanced out to be “fair” to the rest of the game. Weekend Thought: What did you think of this week’s cards? Expecting any great combos to come about from them all? Would you be willing to throw these into one of your decks to try them out? Think they might be great tech or just binder fodder? We seem to not have a shortage of good Fighting Pokemon with single energy attacks that can be boosted further by other cards. Couple good single energy attackers include – but not limited to – Landorus-EX, Lucario-EX, Buzzwole-GX, Sledgehammer Buzzwole, Lucario-GX,……and this one, Regirock. The reason is not Hammer Arm, which does 100 for FFC and discards the top card from your opponent’s deck. It could go either way; you can take away a crucial card or you can help your opponent by getting rid of a card that they’re going to discard anyways. It’s single energy attack is Enhanced Stomp, which does 20 damage plus 20 more damage if this Pokemon has a Pokemon Tool attached to it. This is enough incentive to take advantage of bonus damage. Ideally, you can attach a Choice Band to do 70 damage to EX/GX Pokemon, and Diancie Prism Star makes it 90 damage. Expanded has Regirock-EX and Strong Energy to boost damage output even further. The new Max HP – before factoring cards that boost HP – is 270, claimed by Snorlax and Eevee Gx Tag Team. Regirock can 2HKO it at best in Standard format, but it can go for the OHKO if using Expanded cards. Choice Band, Strong Energy, Diancie Prism Star, and 3 Regirock-EX is needed to OHKO this Tag Team for 3 prizes. Seems like a lot of resources, but you gotta work for that prize. That example of another Tag Team card showed that the new threshold for 2HKOs is doing 140 or more damage. Makes regular Stage 2 Pokemon more frail than ever; not even 180 HP on a Stage 2 is safe from being OHKOed. Even with Fighting types already have a lot going for it, Regirock could barely make the cut against this behemoth. Otherwise, it’s good to have for the rest of the game if you don’t expect much out of it. In Limited, Hustle Belt is the only Pokemon Tool of this set, which will help Enhanced Stomp. Not only you do 40 damage, but you can deal 60 more damage if it has 30 HP or less remaining, and it has to have been damaged in the first place. Otherwise, if you didn’t pull one, then Hammer Arm is the next alternative to be used. 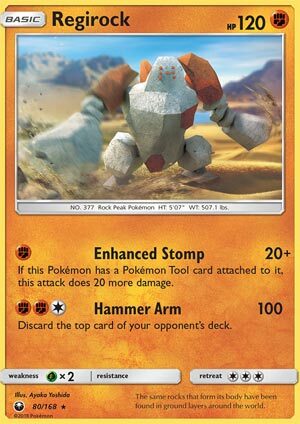 Regirock (CES 80) rumbles its way into the Standard format from the Celestial Storm expansion set. This 120 HP Basic Fighting Pokemon has two good attacks. Enhanced Stomp does only twenty base damage but does twenty more if you attach a Tool to Reggie. Hammer Arm – for two Fighting and a Colorless – does 100 damage and discards the top card of your opponent’s deck. So just to let you know, if your opponent is playing Magcargo and you attack with Hammer Arm after they’ve smoothed over, just expect to get an angry red face on PTCGO. I actually enjoyed playing with this card, and I made it a feature Pokemon in a video here. It’s not great, probably not as good as Buzzwole, but it’s not horrible. You can use Diancie Prism to boost damage, and I paired it with Shrine. My Tools of choice were Wishful Baton and Exp Share, not Choice Band, and I rarely came across anyone playing a Field Blower (I think I discarded one though with Hammer Arm). I just felt it was better to transfer energy cards than gt the extra thirty damage. Regirock (SM – Celestial Storm 80/168) rounds out our week. Once again, I am super-short on time, so we’ll dive into the meat of the situation. Regirock is a Basic [F] Type with goodish 120 HP, so-so [G] Weakness, typical lack of Resistance, mildly concerning Retreat Cost of [CCC], and two attacks. The first attack is “Enhanced Stomp” for [F], which does 20 damage, plus another 20 if it has a Tool attached to it. The natural choice is Choice Band, upping the damage to 70 (20+20+30); throw in a Diancie [Prism Star] or Professor Kukui and you hit 90, throw in both and it can swing for 110… which Weakness doubles to 220. Yeah, that is a tall order to OHKO a Zoroark-GX but we’re talking about an ideal situation. Just swinging for an easy 70 with an Enhanced Stomp equipped Regirock against a Pokémon-GX is handy. Against a non-Pokémon-GX, this exact, minimal combo still does 50 damage for one Energy (or 100 after Weakness). Still useful for finishing off already injured targets, or setting up a 2HKO for something else to deliver. Shrine of Punishment or attacks that spread damage or enjoy bonus Bench hits can also make pseudo-OHKO’s possible. Prior to rotation, this damage might be boosted by Regirock-EX or Strong Energy. This is why we three decks in the top 32 of the 2018 World Championship Masters Division ran a copy. Expanded adds Muscle Band to those options, but back to the Standard Format, and this time post-rotation, we see a Regirock or two in [F] (mono or mixed) Type decks after Worlds as well, but not in the most recent events (possibly barring some results I have yet to Ctrl+F). That could mean Regirock’s 15 minutes of fame are up or it could just mean it wasn’t quite the best choice for a few events and will pop up again later. Decks that do manage to pay the [FFC] for the second attack, which wouldn’t be too bad for a deck with Counter Energy, can enjoy “Hammer Arm” for 100 damage, plus milling the top card of your opponent’s deck. Not mind-blowing, but adequate for a Basic such as this, I think. If the cost was [CCC] or [FCC], it’d be more than adequate. This card looks like a great pull for Limited Format play unless your luck actually quite good: you need to have pulled something totally incompatible with Regirock but also so good you’d run it instead! Regirock isn’t big enough to be a sound +39 deck option, and even though the only Tool this expansion is Hustle Belt, the base 20 is all right in Limited. Hammer Arm is still a bit pricey but the 100 damage and mill are both more effective. The Retreat Cost is much more painful, however, as is the Retreat Cost if either should matter.